The biggest lake in the world, Lake Tanganyika, in Tanzania, in East Africa, is of exceptional beauty. For residents, getting to their villages huddled on the south shores of the lake is a difficult adventure. Tanzanians have two options: 20 hours in a pick-up over rutted roads or 3 days sailing on the oldest freighter in the world, the LIEMBA. 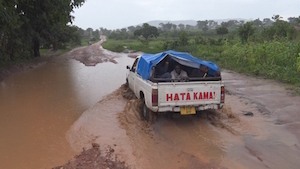 On the trail, traders try to get to market, but the downpour of rain turns the road to mud. On the old tub, the passengers are piled up in the crowded holds. The captain has trouble maintaining calm.